Monday night began the WIAA Championship Series with the regional competition held at Middleton high school. 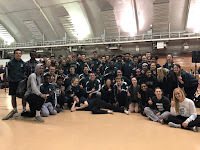 Madison Memorial competed with athletes from eight other local schools hoping to finish in the top 4 of their respective event to advance to Thursday's sectional competition. The Middleton Regional is a very competitive regional and many of the athletes who missed out on making it to sectionals could have won multiple other regionals around the state. The truth of the matter is that we compete in this regional and the talent on our team is what helps make this regional/sectional so tough. A big congratulations to those athletes who competed at regionals and an even bigger congratulations to those who earned a spot in sectionals. Everyone should come out on Thursday to help work the sectional and cheer on your teammates to earning a birth in the WIAA state championships. Earning sectional births with their top 4 finishes: 1st place winners - Corinne F in discus (129' 10"), Daurice F in the 100m hurdles (14.94) & 300m hurldes (39.78), and Jester W in 100m dash (10.80) & 200m dash (22.17). 2nd place finishers - Micah P in triple jump (45' 3"), boys 4x400m relay of Daurice F, Josh P, Nick M, & Jester W (3:26.52), Marissa H in the 100m dash (13.14) & 200m dash (26.12), Nick M in the 300m hurldes (41.30), and Daurice F in long jump (21' 2.25"). 3rd place finishers - Sienna C in the 3200m run (11:32.98) and Corinne F in shot put (36' 9.5"). 4th place finishers - Jonah W in the 3200m run (9:50.89) and Sydney S in high jump (4' 10").